Sometimes it feels like there’s too much work to do and not enough time to get it done. When the pile gets too high, it’s easy to panic, which can slow things down further. Instead, take a step back and think of ways to be more efficient and handle the load better. Building off our prior advice for setting goals and organizing your work space, putting them together can set you on the road to efficient habits. Having the right stock of supplies helps too. Here are two tools to help you get the most out of your time. Shop ticket holders have been around forever and were designed for warehouses, factories, and other large facilities with a lot of workers constantly on the move. Holders have holes for hanging and sheets can easily be swapped in and out. They also have a hidden feature making them perfect for using at your desk: the vinyl covers work as a dry-erase surface. You can use them to make reusable checklists, to-do lists combining routine tasks with unique jobs, or any assignment where you have to answer the same questions repeatedly. Just insert a sheet with the parts that stick around and write whatever is temporary. You’ll even avoid desk clutter by hanging it on your wall. We’ve emphasized clearing your desk of all but the daily essentials. You might think shoving off a calculator is a smart move. After all, you’ve got one on your computer and your phone. But if you are regularly playing with numbers, especially outside of spreadsheets, you’ll want to keep it around and it may even stay on your desk. Pulling a calculator app on your computer pulls you away from the window you’re working on and opens another one. Your monitor(s) should be treated like your desk with only the important stuff on it at any given moment. Meanwhile, your phone is a minefield of potential distractions. 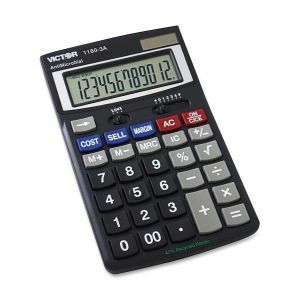 Keep a desktop calculator within reach, preferably one with nice big buttons like the Victor 1180-3A, so you can make quick calculations without leaving your screen or losing focus. When you think about spare office supplies, you’re probably looking at the cabinet full of extra paper clips and Post-It notes. Those aren’t the only items where having plenty of stock makes a lot of sense. This month’s Warehouse Deals page emphasizes surplus for the breakroom and employee health, offering items that are easy to run out of and important to have on hand. Your break room always needs replenishment. 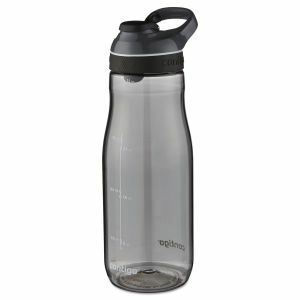 Whether employees are going for coffee, water, or other beverages, you can never have enough cups for them. 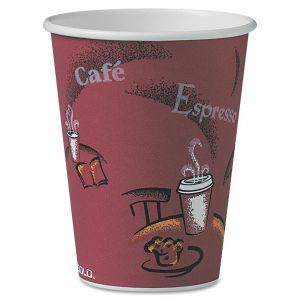 You’ll want to have cups for hot and cold drinks- paper for hot beverages and plastic for water, juice, and soda. Plastic silverware is also necessary- particularly spoons. A box of 1,000 is now on sale. How many hand sanitizer dispensers are around the office? Are they available for every desk? Are there stands for each department and outside meeting rooms? Sanitizer should be available at each workstation and in public areas where germs can spread. That means a lot of dispensers, which creates the need for a good stock to have on hand. You’ll find deals on a two-liter bottle or a 12-pack of 8 oz. 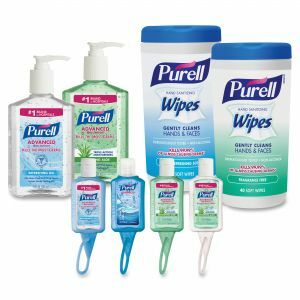 Purell dispensers, and boxes holding 120 sanitizing wipes. Warehouse Deals are here until the end of the month! Previously, we suggested a few products from our Organization page to help clear papers off your desk. It’s easy to see these suggestions and follow them for a few days, but without a good system and routines in place, the clutter may find its way back. To stay organized for the long haul, there are important steps to take. Look at all of the office supplies you have on your desk. Do you have a stapler? A tape dispenser? 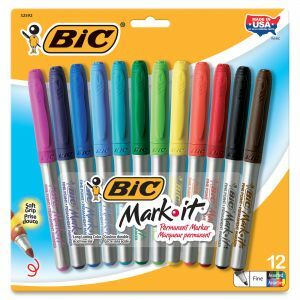 A holder full of paper clips, pushpins, or extra pens? All of these are good to have around, of course. But think about how often you actually use them. If it’s not every day, why is it out in the open? Your desk surface should be limited only to items that are always in use. Reserve a drawer, preferably a top drawer, for important supplies that might be used a couple times a week. That makes them just as easy to get to, but frees up desk space for getting work done and creates more incentive for keeping it clear. A desk already full of unnecessary items makes it easier to excuse more of a mess. If you have a lot of papers coming in, you probably already have some sort of letter tray. If not, it can be a good way to process incoming work. The key words here are "can" and "process." The trick to managing a letter tray is never to put anything back in there once you look at it. Once you take it out, either deal with it right away or mark it with Post-It flags as discussed before. A good strategy would be to assign colors based on urgency and importance, and whether the paper itself ultimately needs to be archived (and how accessible it will need to be) or if it can be tossed once the work is done. Once marked, put it in your file box or a To-Do folder- somewhere you can get to regularly but where its contents won’t distract you while you’re working on something else. 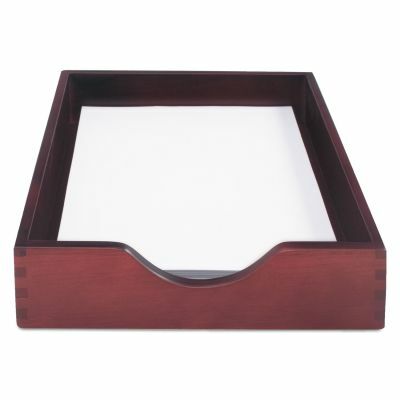 Refresh your To-Do pile frequently and clear out your letter tray daily. Making a habit of regular cleaning is a good way to promote organization. It’s a good task for Friday when you’re counting the minutes until the weekend. 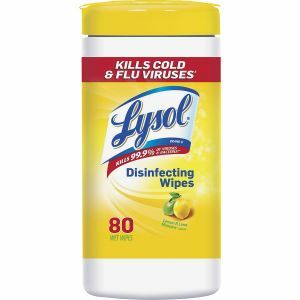 Cleaning your entire desk surface with a disinfecting wipe is a great way to prevent the spread of disease, but is also easier when the desk is clear. You’ll be encouraged to put stuff away, might find loose notes that can be discarded, and challenges you to think about how useful everything on your desk is. By keeping it on your mind regularly and making constant assessments and adjustments, you can keep your desk clean and free of distractions and use it for getting work done instead of storage. Everybody can stand to be more organized. Knowing where things are and where things go is an easy way to be more productive and maintain a less cluttered work space. Without a comfortable system, you can end up wasting time looking for things, missing important memos and deadlines, and feeling trapped by all the paperwork. This month we have several sales, coupons and rebates on products designed to help you sort everything out. Let’s start with loose papers. If there are random sheets of paper around the desk, you can’t tell at first glance whether they require action or provide information or can be archived or tossed. Post-It flags are an easy way to at least spell that out. With a color-coded system, all you need to do is stick the right color flag on each paper as you see it and you’ll at least have a sense of what everything is, even if you aren’t able to get to it right away. The ultimate objective, of course, is to clear your desk of papers. Once the work is done and papers are no longer needed, it’s easy enough to stash them in a file cabinet or toss them completely. When paperwork still needs to be done or may need to be recalled quickly, to the point where you’re tempted to keep them on the desk, try a file box. 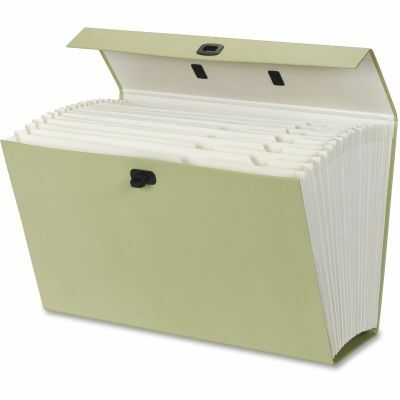 Similar to an expanding file, file boxes have plenty of compartments for organizing and archiving papers. 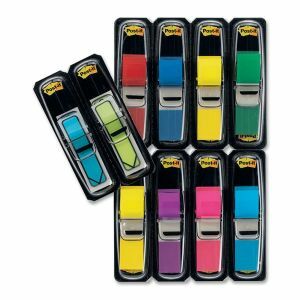 These, however, have an overhead flap and sit upright, so you can keep it on your desk and open it easily for quick retrieval of any files you may need. You can put all your to-do work in the front pocket and it’ll be just as accessible as anything on your desk. It’s even portable for working on the go. Check out our page to see all of our organization deals. Right now, find a coupon for a free Stow Away Crate with an order of $150! It’s hard to appreciate how useful a laminator is until you have one and start using it. Until you’ve got the tool at your disposal, you may not think about how many papers around your desk or posted around the office carry important information that should be preserved in case they’re damaged or accidentally discarded. Laminating is easy and not only protects sheets of paper, but makes them feel significant. 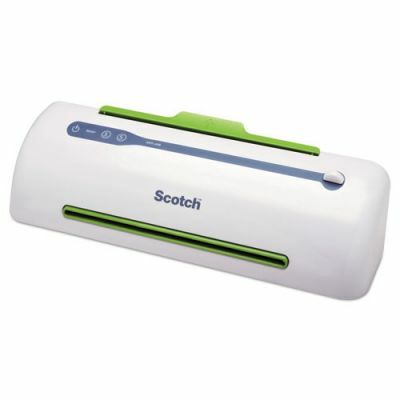 Now, you have an opportunity to get a Scotch laminator free! The TL-906 laminator has a short warm-up time, is easy to use, and has a feed mechanism designed to prevent jamming. It offers professional quality lamination in a small package. To claim a free one, all you need to do is buy five packs of laminating pouches, which are required to use the product anyway! This will qualify you for a rebate to get the laminator at no charge! Two other rebates from 3M work much the same- buy the product to get the free dispenser! 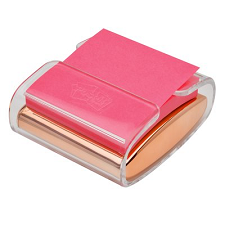 These dispensers go hand-in-hand with a sleek design and a fine rose gold color, and available with the purchase of one qualifying Post-It Note or Scotch Tape product. All three rebates run until June 30. 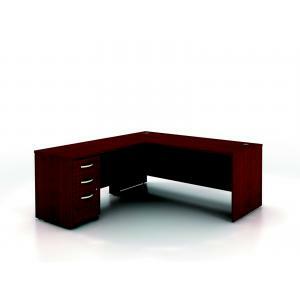 Take a look around the desk in your office. It should be familiar and comfortable and efficient to you, but when’s the last time you made any major changes to it? Has your space evolved through the years or is it the same chair and monitor and lamp you had when you started? Are you sure they’re letting you be at your most productive? Every new year invites everyone to rethink who they are and to try some new things. Improving your office space is an easy place to start. Check out our New Year, New Office page for a number of great ideas for big-ticket upgrades to your office. Does your desk space work for the way you use it? If you need more storage or your work surfaces need to be positioned better, a new desk may be worth the investment. Selected Bush and Hon desks are now on sale. If folders and record keeping space is becoming scarce, consider a new file cabinet from Lorell. How about your seating? If your current chair is wearing out or uncomfortable, we have models on sale from Alera, OIF, Lorell, and Hon. 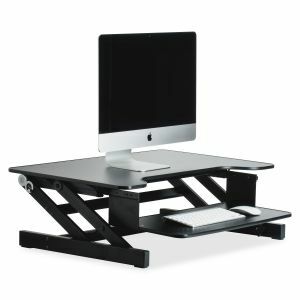 This is also a good time to convert your desk into a sit-stand workstation. Standing desks allow you to work either sitting or standing, improving metabolism, alertness, and posture. We have several models available that adjust your keyboard and monitor to allow work from either position. Options on sale include Lorell and Victor for converters where the monitor stands on the surface, and Ergotron and Balt for models where the monitor (or monitors in dual screen stations) mounts. In addition to all these great products on sale, our New Year, New Office page also has coupons available for any refurbishing. Right now, get $20 off an order with at least $100 worth of office decor products such as lamps, frames, or other decorations! Happy 2017 from all of us at OfficeSupply.com! The new year brings with it a good time to think about the storeroom in the office. A year of hard work can drain the supply closet, so before anything runs out, determine what you need to stay productive with no supply shortages during the new year. We're here to help with deals on items that may need replenishment as the year begins. Let's start with binders. Whether the meeting's about a proposal, a review, or just to present information, a well organized binder can help support a presentation and provide details for everyone to take back to their desk and peruse properly. 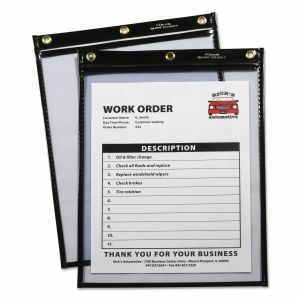 Universal economy view binders are on sale in one inch or two inch sizes, offering plenty of space for loading information for clients or co-workers. 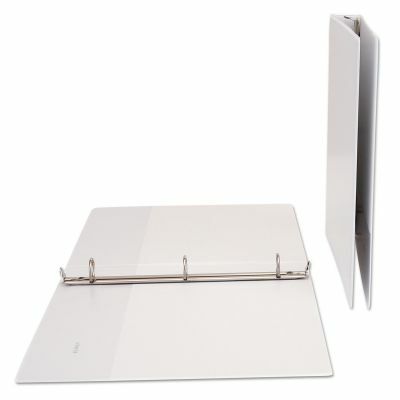 As a view binder, they include sleeves for inserting a sheet into the spine or cover. How is your supply of labels doing after all the holiday mailings? 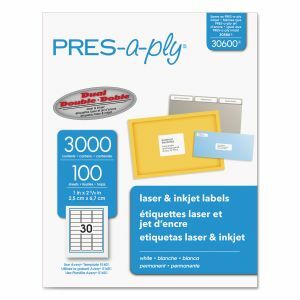 If you're in need of more and are on a budget, try Pres-A-Ply labels, an economical alternative from Avery. They come in the same sizes and use the same Avery templates, only without some of the innovations like Avery's Easy Peel. 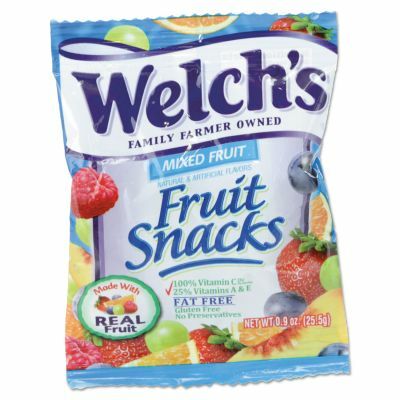 If you prefer, packs of those are on sale too! Check out our Business Essentials page to save on these products, along with coupons for envelopes and legal pads. 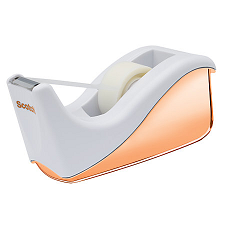 You'll also find rebates to score a free dispenser for Post-It notes or Scotch tape. Sales run through the end of January.